Illinois Personal Injury Statute of Limitations | Hupy and Abraham, S.C.
Every state, including Illinois, limits the amount of time that you have to file a personal injury lawsuit. These laws, known as the statute of limitations, benefit both the person who was hurt and the person who is being sued. The person who was hurt (the plaintiff) benefits from the statute of limitations by having to take action when evidence is still attainable and by getting a fair recovery sooner. The person who is being sued (the defendant) benefits from having a time certain by which the plaintiff must take action so that the threat of litigation is not present indefinitely. In most cases, the Illinois statute of limitations provides you with two years to file your lawsuit in court. The two-year clock begins running on the date that you were injured or the date that you should have known that you were injured. There are some exceptions to this general rule. The statute of limitations may be extended, for example, if the person who was injured was a minor or was mentally incompetent at the time of the injury. If you miss the statute of limitations deadline then you will likely lose your right to make a recovery. The defendant will bring a motion to dismiss any lawsuit that you file in court after the statute of limitations has expired, and you should expect the court to grant that motion to dismiss. This will leave you without a recovery. Don’t let this happen to you. 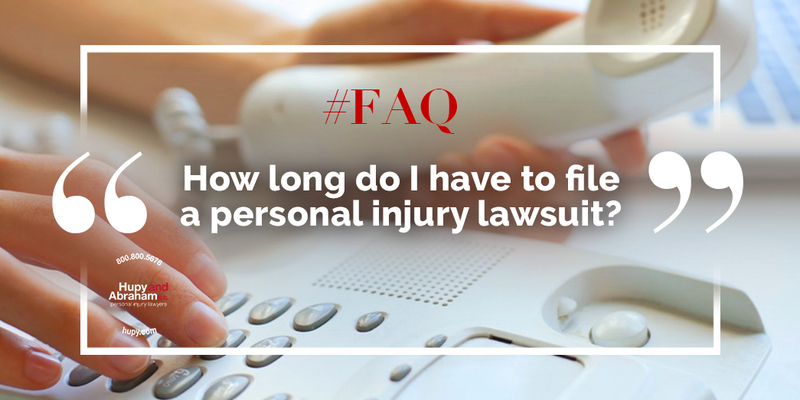 Instead, contact an experienced personal injury lawyer as soon as possible after your injury to make sure that you don’t miss the statute of limitations, to make sure that all of your rights are protected and to learn more about how an Illinois personal injury case works. Contact us online or call us directly at 800.800.5678.